Beavers are two species of large, aquatic, flat-tailed rodent of the Northern hemisphere. The only larger rodent is the capybara. Beavers live in dams, some of immense size, which they construct by felling waterside trees. Though superficially this can appear destructive, the activities of beavers do much to preserve the existing forms of rivers and stabilize their flow, and provide significant areas of wetland habitat in their vicinity. Beaver fur was formerly much sought after, and unrestricted hunting and trapping has done much to reduce their range both in North America, and in Europe, where it historically became extinct in Great Britain and France, though reintroduction programs are now underway. During the 18th century, the beaver was ruled to be a fish by the Roman Catholic Church, on the basis of the Summa Theologica by Thomas Aquinas. As such, it may be consumed during Lent. 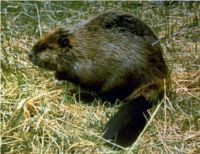 Though very similar in appearance the European beaver (Castor fiber) and North American beaver (Castor canadensis) cannot hybridize, because the European bever has 48 chromosomes while the North American beaver has only 40. This page was last modified on 24 June 2016, at 18:37.